Participants in our Edible Book Festival this year were Happy Ever After! See highlights Come join us again on April 1st, 2019. Finals are upon us, so this month’s staff interview focused on stress relief strategies. I asked everyone to share their favorites. Nicole Treesh, Library Director: Doing word puzzles on my iPhone, using free apps like Words with Friends, Word Crossy, and Infinite Word Search. Elina Puckett, Evening Librarian: There is nothing more easily accessible, free and relaxing for me as a walk outdoors. I call it my “internal shower”, as it does exactly that – it cleanses your system inside out, by pumping freshly oxygenated blood through your veins. It gets you de-stressed and gets your head straight. Don’t be afraid of the weather – there is no bad weather for a walk. Hot or cold your body will adapt to it in just 5 to 10 min of walking. And guess what, it doesn’t have to be only at home – a lunchtime walk increases your learning and working productivity. Best nearest spot to Ivy Tech – Johnny Appleseed park. Carol Gibbs, Library Assistant: My number one stress reliever as of late is holding a baby. There’s nothing better than cuddling a squishy little body, especially if you get a big toothless smile back. Everything stressful melts away. I realize not everyone has access to a baby, but maybe I could talk my daughter into some sort of rental agreement? I have some stress relief available in my office, too – I have lots of bubble wrap! We are united in recommending petting a dog or cat for stress relief, and as usual we will have therapy dogs in the Library during exam week. Check our library website for the schedule. If you were on campus on Monday, April 4th, we hope you had enough time to stop by the Student Life Center and sample all of the wonderful culinary and literary creations at the 10th Annual Edible Book Festival. This event, hosted by the Ivy Tech Northeast Library, brings together students, staff, community members, and local businesses to showcase their edible interpretations of their favorite books. This year’s celebration featured 20 unique creations and brought in 200 attendees. This year’s edible books covered a wide range of literary favorites, including The Lord of the Rings, Hitchhiker’s Guide to the Galaxy, and The Great Gatsby. Children’s stories were also well represented with delicious renditions of Winnie the Pooh, Chicka Chicka Boom Boom, and The Lorax, as well as some lesser-known children’s tales such as Mean Soup, Creepy Carrots, and Hold the Anchovies! 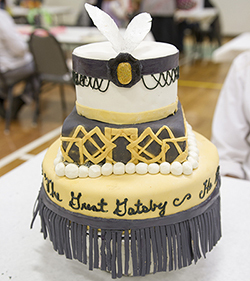 Some participants really flexed their creative muscles by adapting works that aren’t normally associated with food into delicious dishes, such as the Emancipation Proclamation, The Haunted Mesa by Louis L’Amour, and Online Gambling and Crime, an academic text about the controversies involving the online gambling industry. Leave it to a librarian to come up with that last one. When it comes to edible books, the flavors are just as important as the stories, and this year did not disappoint. Attendees were treated to Edible Books comprised of pizza, barbecue ribs, burritos, soup, and popcorn on the savory side of things. As always, dessert creations were also plentiful, with cookies and cakes coming in flavors from vanilla and chocolate to caramel marble, peach ginger, and oatmeal-carrot. This year’s Edible Book Festival also featured a performance from professional storyteller Lou Ann Homan whose wonderful narrative flair entertained both children and adults. There was also a craft station where children and their families could make food-based necklaces with a charm representing a well-loved book. Not to leave any sense neglected, the soundtrack to this year’s festivities was an eclectic mix of songs from films that were inspired by literary works. The winning edible books were selected based on audience voting, and this year’s winners were an impressive bunch. The first place winner was Ivy Tech student, Claudia Hollinger, with an edible book based on Harry Potter and the Sorcerer’s Stone by J.K. Rowling. Second place was taken by community member, Cayla Veach, with her creation based on Just You and Me by Sam McBratney. Taking third place was Ivy Tech student, Adrienne Cottrell, with her entry based on The Great Gatsby by F. Scott Fitzgerald. These three talented participants took the prizes this year, but each entry showed artistic skill and creative thinking. It’s never too early to start thinking about how you can take the top prize next year! If you didn’t make it out to the 2016 event, be sure to check out the coverage on our local NPR station< WBOI, as well as the story that ran on local Fox affiliate WFFT. The Journal Gazette was also present to cover the event. As always, if you need a good book, or inspiration for your own delicious dishes, stop by the library and browse our collection today!